Money for the arts . . . !! As a fan of the arts and a closet geek, I find that very, very cool. I like to take the "tough love" approach with my beta cells. They can function on vitamin c like everyone else, is what I say. "Resolving Pathways of Functional Coupling in Human Hemoglobin Using Quantitative Low Temperature Isoelectric Focusing of Asymmetric Mutant Hybrids"
It was OK. But it wasn't one of the better functional-coupling-involving-mutant-hybrids movies I've seen. I thought they left too much out from the book. Who knew boffins can dance? I laughed! I cried! I calculated pi to 75 decimal places! So that would be vitamin Dorky? PhD title: The role of Vitamin D in beta-cell function. The crucial role of sunlight exposure as the most important source of vitamin D in humans is highlighted. Vitamin D is newly recognised to be involved in the function of many organ systems, including the beta cells of the endocrine pancreas. These cells make insulin in response to glucose stimulation. Initially, the beta cells are in an unstimulated state, with minimal activity. At the arrival of the sugar plum fairy (symbolising glucose), the cells are able to sense the presence of glucose through the enzyme glucokinase. When glucose enters the cells through glut 2 transporters (marshmallow feeding), it is metabolised to produce the energy molecule, ATP. Through a number of steps, this leads to a rise in positive charge inside the cell, which ultimately triggers the export of insulin-storing granules by a process known as exocytosis (depicted here by the blowing of bubbles). Normal insulin secretion requires the coordinated function of beta cells via intercellular connections and communications as they work in concert. We are investigating whether vitamin D has an effect in improving beta-cell function and increasing insulin secretion... are they "walking on sunshine"?? If I knew dancing was involved, I might have taken more chemistry classes in college. Geeks can be so much fun! Steve, she'll make sure you're well taken care of. 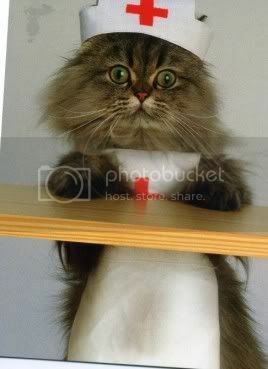 She'll bring you insulin shots, you bring her catnip. Somehow when I think of a hot nurse who makes house calls, a different image comes to mind. I would have disqualified them for not choreographing the prologue. I would have dissed them for prolonging the choreography. Steve---google "niacin and diabetes". They've found that niacin supplements can greatly delay the need for insulin in controlled diabetes. You can buy niacin a whole hellofa lot cheaper than insulin, that is for sure. Well, I just googled it and now they say it's not good. I wish "they" would make up their minds, whoever they are. Some articles say extended release, some say not at all. Just knock Walter and that should do it. sheesh, Annie...you mean you didn't LIKE IT?? The guy at the beginning reminds me of Steve Martin's "Happy Feet"
PhD Title: "The Pathogenesis of the Gag Reflex and Involuntary Projectile Vomiting"
Who knew there were so many uses for interpretive dance! I think Congress should try it too! At least I could laugh until I cry rather than just...cry. They tried to do a dance about the Hadron Supercollider, but at the end all the dancers were sucked into a black hole. The dance about quantum physics. No one knew when it started, when it ended, who was in it, or where it was performed or not performed. It just was and then wasn't.